Many Great Cuisines are represented here in Houston, not just by nationality or style, but also by subgenre. Sud Italia in Rice Village focuses on Shanon Scott’s travel and dining experiences in Southern Italy as its source of inspiration. The Mediterranean coastal seafood and traditional culture left quite an impression on Scott and his wife Wende. Since last year, Sud Italia has taken a cozy space in a converted house and served up a fresh and wonderful take on this cuisine. Despite the usual parking challenges presented in Rice Village, this destination provides diners a great view of the action from Morningside and University. Large windows give an open feel, with the house-style setting feeling intimate. 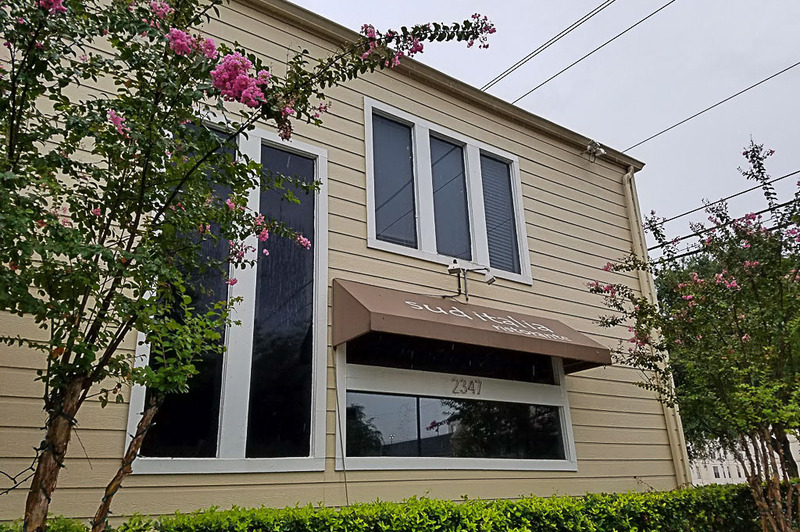 A covered patio with ample seating provides an opportunity for al fresco dining on more temperate days in Houston. Of note, the wine list features varietals from the five regions of Southern Italy. These include red, white, rose, and sparkling. Wines are sold by the glass or by the bottle. However, BYOB and corkage are not available. Their menu includes both lunch and dinner service during the week, as well as a Saturday Brunch. The restaurant is closed on Sunday. The brunch menu includes two styles of frittata, an Italian style baked omelet, as well as a decadent salmon and eggs dish. For seafood lovers, the Insalata di Tonno made with grilled tuna steak and hearts of lettuce with a roasted pepper dressing will entice. Appetizers like the Burrata Mozzarella with balsamic vinaigrette, basil and mint will appeal to the more traditional Italian diner. And Pastas such as the Pizzaiola di Spaghetti al Nero di Seppia, squid ink-infused spaghetti tossed with fresh lobster meat and homemade pizzaiola, may sound over the top, but are in fact a wonderful and tasty excursion into the depths of flavors. Whatever your level of adventure, Sud Italia has a dish for you. Sometimes the best time to try a new restaurant in the Houston area is during Houston Restaurant Week (HRW). This gives the diner an opportunity to try smaller portions of regular or special dishes at a moderate price, as well as help the Houston Food Bank. Sud Italia is a participant in HRW this year, and although their special menu is listed as a three course dinner menu, it is available for lunch and dinner at the same price ($35.00—Tax, gratuity not included). I swung by on a rainy Monday after having looked over their menu and noticed their seasonal items, some of which were on the HRW menu. After consulting with the server and mulling it over, I chose to start with their seasonal salad: Insalata d’Anguria e Ricotta. This is a fresh arugula salad with fresh watermelon and salted ricotta. When the salad was presented I was blown away by the plating. 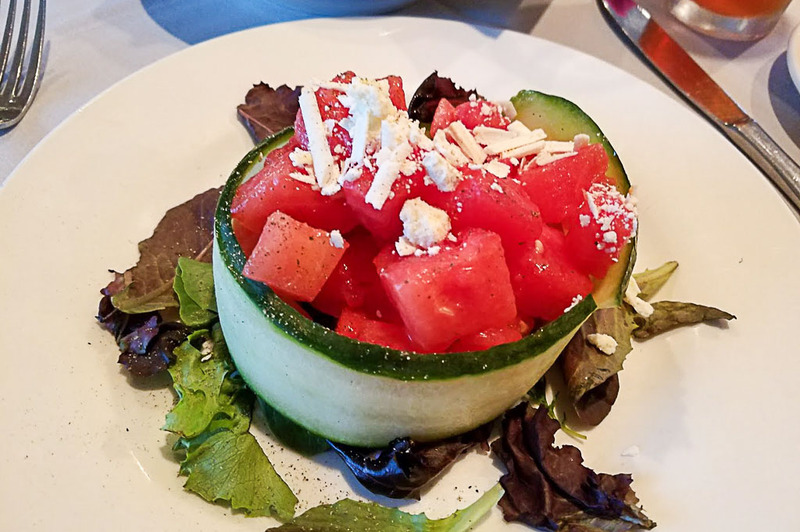 The arugula is like a bed featuring watermelon on top wrapped in a thin slice of cucumber and dusted with salted ricotta. One bite was cool, refreshing, sweet and salty bliss. Normally a salad is not as interesting unless it’s a Salade Nicoise, but this fits Summer nicely. For my second course, I had Orecchiette con Salsiccia, Rapini e Pomodore e Porcini. 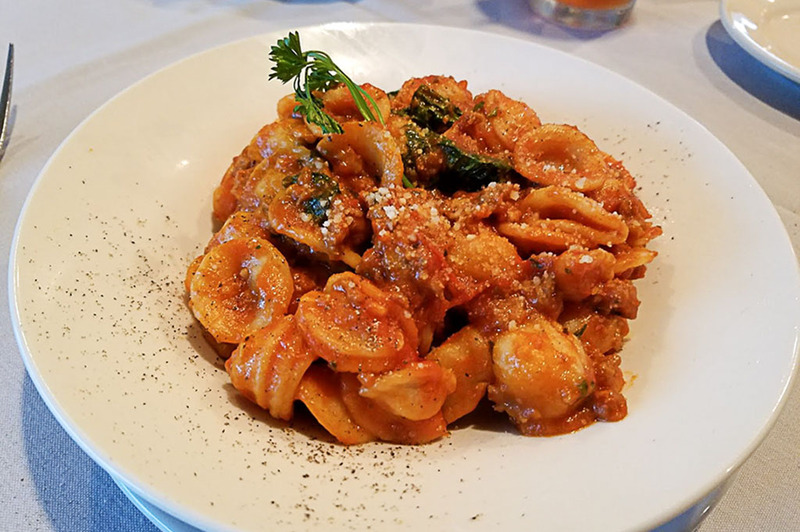 This is orecchiette pasta—flat round pasta—with sausage, rapini and porcini with a light pomodoro sauce. It was served in a nice ceramic bowl and had a spicy, robust aroma. The first bite yielded fennel, garlic, basil and spicy peppercorn. The pasta was hearty, satisfying and was well complemented with the other ingredients. Had I not been prepared, this course would have been a nice meal unto itself. The main course was well worth the trip and was highly recommended by my server and another customer. 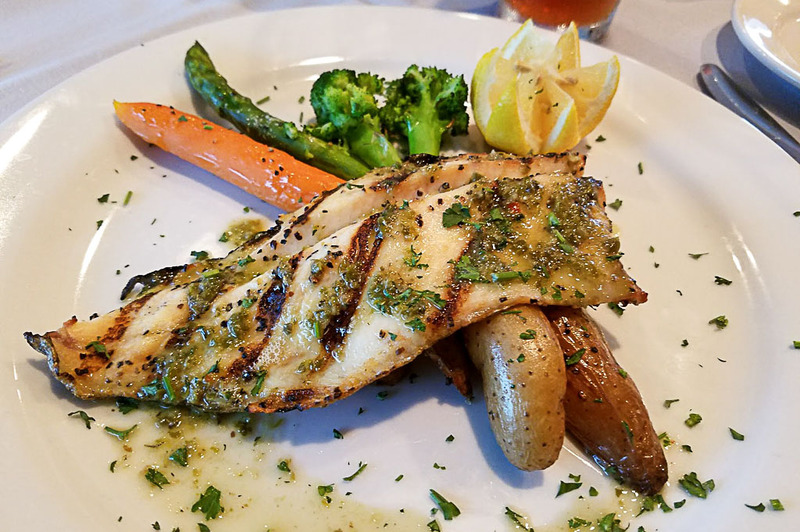 This is the Trotta Arcobaleno al Ferri: grilled rainbow trout filet topped with white wine and fresh herbs served over grilled vegetables. The nicely herbed, grilled trout filet has a delicate texture, but packs a meaty bite or three including the skin. The vegetables—my plate had carrot, asparagus, broccoli and fingerling yellow potatoes—were fresh, the greens had a snap to them and the potatoes were properly cooked. What also stood out besides the herbs, seasoning and substance was that it was satisfying, but not excessive nor heavy. There was a nice use of olive oil, but it wasn’t greasy nor dry. Clearly the chef took great care in the dish’s preparation, and this diner noticed! As a conscientious diner, I very much enjoy good local restaurants of any cuisine that take pride in their cooking, take care of their customers and show respect to the food. Sud Italia is certainly one of these places, and Shanon Scott has clearly established a good presence that I hope will be with us for many years to come. I will most certainly be back!